On April 22, 1892, 13 initial members organized the West Side Tennis Club with the modest goal of renting ground on Central Park West, between 88th and 89th Streets, for three clay courts. The courts opened on June 11, 1892, and Club membership required a $10 initiation cost, a $10 annual fee, and the ability to play a good game of tennis. By the end of the first season, the Club expanded to 43 members and five courts. The “clubhouse” consisted of a shed with two dressing rooms and cold showers. After ten years, the Central Park West property became too commercially valuable for tennis, so the Club moved to 117th Street near Columbia University, which had room for eight courts. Through the largesse of the land’s owner, Mrs. John Drexel of the prominent banking family, the Club paid a mere $20 per court annually. The Club built a new clubhouse with hot showers through its great savings. Membership expanded to 110 members by then. With the Drexel lease up six years later, the West Side rented a location at 238th Street and Broadway, covering two city blocks with room for a dozen grass courts and 15 clay courts. The Club hosted the Davis Cup matches with Great Britain in 1911. The matches featured the great Maurice McLaughlin (the “California Comet”) and crowds numbered in the thousands. With the successes, however, came the realization that the West Side’s location was inadequate to accommodate the crowds. A committee was formed in 1912 to find a permanent location for purchase. The committee scouted over 30 locations and then narrowed the field to properties in the Bronx, Kew Gardens, and Forest Hills. On December 3, 1912, the Club voted for the Forest Hills location. They purchased the land, a few blocks from the Long Island Railroad Station, for a $2,000 down-payment and $75,000 mortgage. The Tudor-style clubhouse, built the following year, cost approximately $25,000. 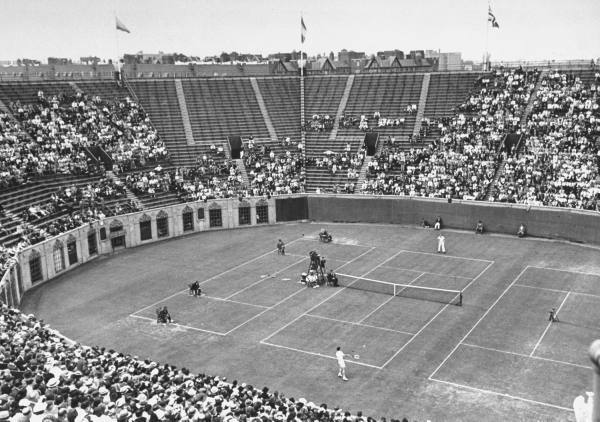 New York City featured a world-class tennis center by the spring of 1914. The 1915 transfer of the United States Lawn Tennis Association National Championship (later the U.S. Open) to the West Side Tennis Club from the Newport Casino was a watershed event in the history of tennis. For the next six decades, the Championship would be held at the West Side. Along with tennis events, the West Side hosted music concerts in its stadium for decades. Frank Sinatra, The Beatles, Jimi Hendrix, Rolling Stones, Bob Dylan, The Who, Diana Ross, and the Boston Pops were just some of the musicians that performed. By the late '70s, the popularity of the Open had boomed and the 15,000-seat Forest Hills stadium had become too small to handle the crowds. The USTA moved the Open to the broader expanses of Flushing Meadows in 1978. The Club celebrated 100 years of tennis in Forest Hills in 2013. Check back each month for new information as we rediscover our history.